Dry body brushing, (if you haven’t heard of it), is simply exactly what it says on the tin – it’s dry brushing (your body) with a brush. You only have to type it into a search engine to see that it’s posted all over the internet. It’s often talked about in fashion magazines, usually when featuring ways to look good for summer. However it’s not a new thing, it’s been around for years and has always been a hot topic for debate. Articles vary between suggesting that it’s a load of old rubbish to suggesting that doing this one thing will completely flush away all your toxins and rid your body of cellulite! So does it work? Well, In order to answer that question, you need to understand a little bit about the physiology of the body. Here Im going to explain a little about what cellulite is, the skins function in all of this and the body’s toxic drainage process. Don’t worry, it’s not going to be like a school science class where you lose the will to live. 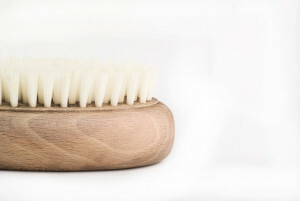 I’m going to keep it as simple as possible and hopefully it should be enough to help you understand how dry brushing can help in your daily routine and if its worth you giving it a try. I will also make clear that I am not a medical professional and the following pieces of information is derived from my own research into the subject. Cellulite is medically known as adiposis edematosa, dermopanniculosis deformans, status protrusus cutis or gynoid lipodystrophy (I hope you were able to pronounce those!) (Wikipedia) It’s described as the orange peel appearance on skin and usually occurs in the thighs and bottom area but can also occur on the stomach, back, arms and calves. It’s said to affect 85% of pubertal women but is less common in men (Avram, 2004) To understand how cellulite occurs, you need to have a basic understanding of the connective tissue structure (what skin is made up of). What Causes Fat to Bulge into the Dermis? There have been a number of factors studied that contribute to the appearance of cellulite, such as links to weight (Gallo Alvaro, 2009), circulation, toxins and the health of the skin. Research found that the connective tissue, which is made up mostly of collagen, allows fat to bulge more when it has become weakened. There is a link to clothing and circulation, where research found that tight underwear/ clothes worn on the bottom half of the body can hinder circulation, causing cellulite. Smoking is also found to have an affect (Finks, 2006) as well as a slow lymphatic system. A study by Sadick and Margo (2007) found that cellulite improved when a person lost weight. Rawlings went on to find that this was because fat cells retract slightly from the dermis in weight loss. So in short, cellulite can’t be removed no matter what you do, it’s part of the body just like fat and muscle. It suggests that if these factors were changed the appearance of cellulite may lessen. Take the Lymphatic drainage system for example, this is a system in the body that helps to expel toxins, if a person suffered from a condition that caused it to slow down, the appearance of cellulite could worsen, however if the person made an effort to help stimulate this system and took steps to avoid toxins it could prevent cellulite from getting worse. Our body has many amazing processes and systems that are working every day to ensure our bodies function properly. Most of the time we don’t even realise they are working away. One of the important features of our body is the lymphatic system. It was originally discovered around the 1600’s but it was dismissed as a simple drainage system. It’s only been within the last 20 years that it was discovered to be a complex system. Made up of vessels (small tubes) nodes (often referred to as glands) and lymphatic fluid, it is essential for fluid regulation and the elimination of toxins and waste. Lymphatic fluid forms when excess fluid (including proteins and water) surrounding the body tissue drain into the lymph vessels. These vessels (fine tubes) then carry the fluid all round the organs, filtering through little nodes all around the body (except in the central nervous system) then returns it into the blood stream. There are approximately 600-700 lymph nodes in the body and the amount varies from person to person. Their size also varies from the size of a pin head to the size of a bean. They contain white blood cells called lymphocytes that filter out harmful organisms such as damaged cells, diseases, bacteria, viruses and cancer cells. When the nodes struggle to immediately kill bacteria, viruses and diseases, they become swollen and painful. The most common example of this is if you have ever been to the doctors with a sore throat or cold. You will find the doctor will feel your throat to see if your ‘glands’ are up. The thoracic duct and right thoracic duct are the two major lymphatic vessels. The thoracic duct is located near the lower part of the spine and collects lymph from the pelvis, abdomen, and lower chest. It runs up the the chest and empties into the blood through a large vein near the the left side of the neck. The right thoracic duct collects for the right side of the neck, chest and arm and empties into a large vein in the right side of the neck. It’s important for the lymph to collect excess fluids and return it back into the blood stream, otherwise excess fluid would build up in the body tissues and swell. The lymphatic system doesn’t process this all on its own, it has a number of organs that work alongside it including the spleen, thymus, tonsils and adenoids. However rather than go into excess detail I’m not going to discuss the other processes. However you can find out more about them here. Once the lymphatic process has taken place the filtered toxins move on to other organs such as the liver, kidneys bladder and bowels, which process them further and expel them from the body. Unlike blood circulation, the lymphatic system doesn’t have a main organ that functions to move it around the body (like the blood has the heart). However research has found that the thoracic duct acts as a ‘pumping mechanism’ that is controlled by the sympathetic nervous system (Kinmonth, 1959/ 1960/1982), this has been said to rely partly on movement and gravity such as a persons breathing and contractions of the skeletal muscles. If a lymphatic system becomes slow, it can cause a build up of toxins in the nodes causing aches and pains, bloating and fatigue. The lymphatic system relies on movement to keep it pumping round, but this doesn’t mean you have to start doing aerobics everyday. A simple brisk walk, massage and stimulation of the skin and breathing techniques can help. Dry body brushing CAN have a positive effect on the body, FACT. The stimulation of the bristles on the skin, are similar to that of a massage. Research has proven that massage and stimulation can be an effective way to maintain a healthy body. Body brushing can be good for you, however, it needs to be pointed out that dry brushing alone won’t suddenly sweep away all your cellulite. In order for it to be most effective, you need to combine it with a number of healthy habits. Combined with eating healthily and taking a little exercise, these habits will work together to reduce fat and improve circulation thus improving lymphatic drainage and appearance of cellulite. So if you’re serious about your body, whether you want to lose weight, have a health condition that you want to take control of or just want to make a few healthier changes then dry body brushing is a great addition to your routine. If you’re looking for an easy cellulite cure then don’t bother because there’s no such thing! Dry brushing is suggested to be more effective when done everyday (and more so if done twice a day). Brushing should be done with a natural fibre brush as synthetic brushes are shown to contain harmful toxins from the chemicals used that make up the bristles Buy a brush with a long removable handle. It’s easier to use a brush with no handle when brushing the arms and legs but for the back and shoulders you will probably need a long handle. Do not brush over skin that is sore, broken or highly sensitive. Try it for 30 days – research shows that if you can do something for 30 days in a row you are likely to keep it up Find a time to do it that you will be able to keep to. If you can’t do it in the morning (before work) then do it as part of your winding down routine at night. Remember to clean your brush regularly as it will gather dry skin and dirt! 1.Begin by brushing from the right foot, starting from the sole then moving over the top. Move onto the ankles and up towards the lower part of the leg. Sweep over the knee and up the thigh in long strokes towards the bottom. When you reach the bottom move on to the other leg. 3. Brush the right arm from the palm up to the shoulder then again on your left. 5. Brush down from the neck and over the breasts taking care not to brush too hard. 6. Brush down the back from the shoulders to where your bra strap falls Finish with a shower. For an ultimate boost of the immune system alternate the temperature of the shower from hot to cold (as cold as you can possibly go) as this boosts the production of white blood cells. Avram, M. 2004. Cellulite: A review of its physiology and treatment. Journal of Cosmetic and Laser Therapy, 6, 181–85. Fink, J.S., et al. 2006. Use of intense pulsed light and a retinyl-based cream as a potential treatment for cellulite: A pilot study. Journal of Cosmetic Dermatology, 5, 254–62. Gallo Alvaro C, et al. 2009 Women with weight loss and abnormal mesenteric lymph nodes. Revista Clinica Española. 209:245-246. Heyward, V.H. 2006. Advanced Fitness Assessment and Exercise Prescription (5th ed.). Champaign, IL: Human Kinetics. Kinmonth JB. 1982. The Lymphatics, 2nd Edition. Edward Armold. Pp 80. Rawlings, A.V. 2006. Cellulite and its treatment. International Journal of Cosmetic Science, 28, 175–90. Sadick, N., & Magro, C. 2007. A study evaluating the safety and efficacy of the VelaSmooth™ system in the treatment of cellulite. Journal of Cosmetic and Laser Therapy, 9, 15–20.